School bands probably wouldn’t exist today if students had to buy instruments to try band. For that reason school band rental programs were created, and Amro Music was among the first music companies in the country to offer band instrument rentals. Acquiring instruments is a key component in building a successful band or orchestra program and there are many factors that must be considered: brand preferences, cost of ownership, service after the rental and the ability to trade-in are just a few. Because it is impossible for a band or orchestra to provide instruments for every child, rental programs offer the best way for parents and directors to ease a child into an instrument while offering flexibility. Instrument Quality- Not all instruments and brands are created equally. Selecting a quality instrument is important to ensure it will withstand the rigors of a young player and offer the best opportunity for long term success. Maintenance Coverage –It’s inevitable that an instrument will need repair. Selecting a rental program that takes this in to account will make the repair process much easier for directors and parents. Regular Service – A reputable music store should be able to visit your program on a regular basis. This ensures the needs of the students, directors, and parents are met in a timely manner. Fast Repairs – A student without an instrument can quickly fall behind. In order to keep the class together, it’s important that rental instruments are returned from repair as quickly as possible. 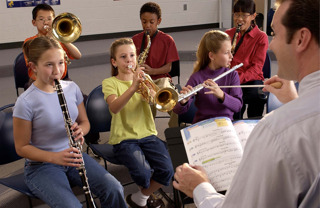 Step- Up Option- As students advance, they will need to move out of a beginner instrument and into a step-up instrument. Rental programs that offer equity in the form of rental credit or trade-ins can ease the financial burden of moving a developing musician to the step up instrument and encourage students to step-up to a better sound instrument. Return Option – While directors and parents hope that students will stay with music, some decide to pursue other activities. Parents should be able to return their instrument after one semester in music, giving their child ample time to determine if band or orchestra is the right activity for them. Increased Retention and Parental Involvement – Students that rent instruments are more likely to stay in music for the long term. In addition, the parents are more involved with the child’s musical development, as they have financial “skin in the game”. Director’s Peace of Mind and Sanity – When a school instrument breaks, it falls on the director and the school budget to manage and pay for the repair. Directors that aim to provide instruments for each students quickly find themselves a full time repair technician and a part time director. Students that rent can have their instrument repaired under the rental plan, freeing up the director to focus their time and limited funds on other matters. Step Up Instruments – A beginner instrument is designed to be durable and withstand the rigors of young musicians. Once it’s been determined that a student is staying with band or orchestra for the long term, its best to move them into a step up instrument, offering improved tone quality and range. A rental instrument allows the parents to build equity to apply towards a step up instrument.